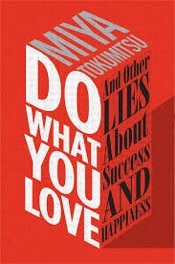 Miya Tokumitsu has a new book called Do What You Love: And Other Lies About Success & Happiness, recently profiled in this Atlantic article and initially sparked by this older Slate article. I haven’t read the book, but the overall theme is that if everyone is supposed to be happy and passionate, then they can’t really complain about long hours or low compensation. Advantage: Employers. One solution is to make the person who benefits from your passion YOU. That is, if you can, find your passion and eventually start your own business from it. Even if you aren’t the sole owner, you should have a strong vested interest your investment of hard work. If you can’t, perhaps you should treat your job as just work. Be proud of doing work you don’t love in order to feed and provide security for your family. There is honor is that as well. Derive joy from what you love in your off-hours, and derive money from your work – and invest that money into assets towards financial independence! I think of financial independence less in black-and-white and more in grey these days. The more income you have from investments, then the more likely you can switch to a job that you enjoy (as such jobs tend to pay less). Alternatively, you could keep your non-passionate work and simply work less hours. Build your success around something that you love — something that is inherently and endlessly interesting to you. Ultimately, what we need in order to be happy is at some level pretty simple. It requires doing something that you find meaningful, that you can kind of get lost in on a daily basis. Even I find it peculiar at times, but I can totally get lost in learning about investing and personal finance. Hours can pass in what feels like minutes. I don’t know if it will be endlessly interesting, but this has been going on for over 10 years now, so I’m taking that as a good sign!